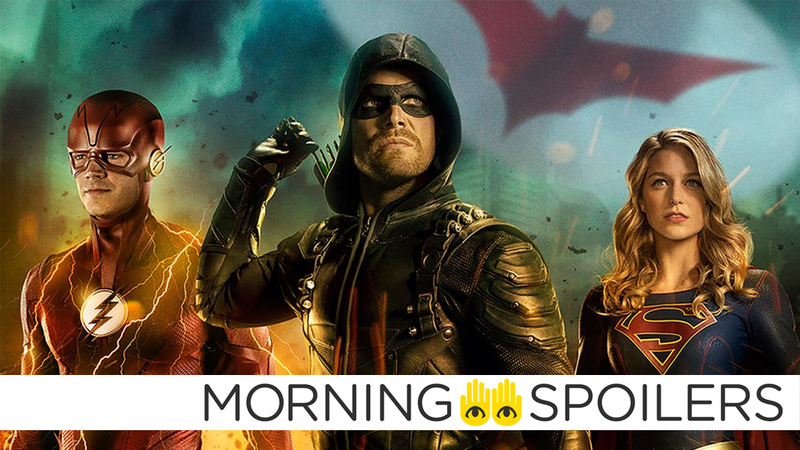 Could This Year's Arrowverse Crossover Involve a Major Batman Villain? Barry, Ollie, and Kara venture to Gotham in this year’s big crossover. There’s a couple of Avengers 4 set pictures to wildly speculate about. Could DC’s Supergirl movie be a period piece? The Bond franchise’s regular scribes could be returning to Bond 25. Plus, new pictures from the returns of Outlander and Supergirl, and Morgan tempts fate in a new clip from Fear the Walking Dead. Spoilers, away! A new set photo from Gwyneth Paltrow from the set of Avengers 4 will no doubt have people speculating wildly about a Pepper/Tony reunion. Pepperony, by the by, is a very good shipping portmanteau. Meanwhile, another set photo of Chris Evans sees Captain America sans Infinity War beard (but avec dog), which, when you think about it, is truly the greatest loss brought about by Thanos’ culling of half the universe. In a new interview with Comic Book, Kristen Stewart revealed the upcoming Charlie’s Angels reboot will include a worldwide network of Angels in addition to the core trio. There is a kitsch nature to the last ones that was super fun, but nowadays if you see a woman in combat, everything should be something completely and utterly well within their ability. “And [the new trio of Angels] work together really, really beautifully. And there’s a whole network of Angels — it’s not just three — it’s women across the entire globe [that] are connected and helping each other. According to The Playlist, the upcoming Supergirl movie will likely be a period piece set in 1970s featuring a teenage Kara Danvers. In a recent interview with Birth.Movies.Death., SpectreVision co-founder Josh C. Waller announced the studio is moving forward with Richard Stanley’s adaptation of H.P. Lovecraft’s notoriously unfilmable The Colour Out of Space, which concerns a brand new color on the visible spectrum. Coming Soon has new photos from David Gordon Green’s Halloween. More at the link. Disney’s Jungle Cruise has officially wrapped filming. Screen Rant has our first look at Brad Pitt as astronaut Roy McBride in Ad Astra. Four new TV spots for the latest Johnny English movie see Rowan Atkinson struggle with magnetic boots, the Tour de France, inflatable rafts, a suit of armor, and more. CBR reports Cassandra Jean Amell has joined the crossover event as Nora Fries, the doomed wife of Batman villain Mr. Freeze, hinting that Victor could play a role in the threat that brings the gang to Batwoman and Gotham City. Or perhaps their roles will be reversed this time? Elsewhere, Elizabeth “Bitsie” Tulloch took to Instagram to discuss her excitement playing Lois Lane. Now, at a time when the noble profession of journalism feels under siege, it’s a privilege to join the club of actresses who have played the dogged reporter. As far back as 1938 when she first appeared in Action Comics #1, Lois Lane has defied and subverted society’s expectations of how women should behave. She was portrayed as opinionated, inquisitive, and an unapologetically badass career woman at a time when many representations of women leaned more towards meek and demure. A billboard for Ralph Dibny’s detective service has been spotted in Vancouver. KryptonSite has several office-centric photos from the season four premiere, “American Alien,” including our first look at Mercy and Otis Graves. More at the link. Just Jared has eighteen set pics of Doom Patrol’s practical Robotman costume. Episode seven of the new season is titled, “Hell No, Dolly!” according to Keto Shimizu on Twitter. Grace Byers spoke to CBR about her character Reeva Payge’s intentions for the Hellfire Club in season two of The Gifted. So the vision that she has is that — and I mean, it’s no secret — she fully believes that it is impossible for humans and mutants to live peacefully in the same world. Her experience has told her that. The present has told her that. She has lost lots of people and lots of things due to that. So it has been proven to her time and time again that it’s just not possible, and so she is working for a world and a nation where the mutants can live unharmed and at peace and free. KSiteTV has images from the season fourteen premiere of Supernatural, “Stranger in a Strange Land.” Click through for more. TV Guide also has photos from the season premiere of Outlander, “America the Beautiful.” Head over there to see the rest.